As a summer community, Bar Harbor enjoys a long history; Native Americans had been summering here hundreds of years before it was “discovered” by the French map maker, Samuel de Champlain in 1604. Unlike today, those early summer residents were not here for “R&R” but rather to hunt and fish. The intervening centuries have a history which could be told of many areas throughout the country. Small communities formed, usually based around one, two or three core families whose progeny would lend their name to streets, rivers, mountains, lakes and even in some cases, towns. Bar Harbor and its environs were no exception. But it was not until the “Cottage” era of the late 1800’s that Bar Harbor became popular with the wealthy, powerful, and influential men and women from such places as Boston, New York and Philadelphia. After the Hudson River School of painters popularized the area with sketches of the mountains and the sea, wealthy visitors flocked to the area as the first summer tourists. Later, they would return to build their “cottages,” many designed by William Ralph Emerson in the classic shingle style. One, Archbold Cottage on Cleftstone Road, was a beautiful Italian-style villa. As with most of the great cottages, Archbold Cottage burned to the ground in the October 1947 fire. 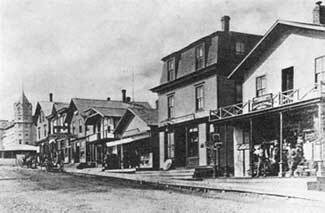 In addition to its “cottages,” Bar Harbor in the late 1800’s was the site of many fine hotels. The Rodick House, built in 1866 by David Rodick on the site which is Main Street at Rodick Place, prospered throughout those years. By 1875, it had expanded to accommodate 275 guests, and reservations were being made up to two years in advance. In November of 1881, 70 carpenters began work on an extension to the hotel, which was to run from the northern end of the old section northward along Main Street for 45 feet, and then westward for 225 feet. When work was completed nine months later, the six-story hotel, advertised as the largest in Maine, had 400 guest rooms, no private baths, a dining room capable of seating 1,000, and a 25 foot-wide “piazza” running 500 feet along the front and one side of the building. 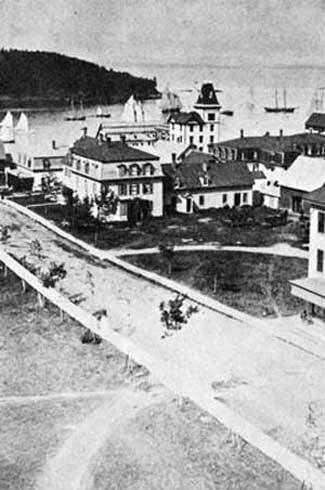 Bar Harbor’s heyday as a watering place for the wealthy lasted from the 1880’s to the end of World War I. The summer colony was undermined by the Great Depression, and World War II, but the final blow was dealt by the Great Fire of 1947. The fire, which started on “The Heath,” a grassy meadow between the Crooked Road and the village of Salisbury Cove, raged out of control from October 21st to the 25th. On Thursday, October 23rd, a massive wind shift occurred, with gusts up to 65 mph. During that day and evening, the fire spread between five and six miles—as much as it had traveled in the past two days. Evacuation was finally called for as the fire spread closer to the town of Bar Harbor, and people were preparing to be evacuated from the town by boats as the access roads were cut off by the fire. A sea evacuation became unnecessary however, and a huge caravan of vehicles was able to make it out between the fire lines to safety in Ellsworth. From the 25th to the 28th, the town of Bar Harbor was surrounded by fires, which prevented the return of evacuees who still had houses. Finally, on the 28th, with any serious threat from fires diminished, evacuees with standing homes were allowed back in, although the fire wouldn’t be officially reported out until November 7th. Months later, fires were found under four feet of snow at Sieur de Monts meadow. When all was said and done, a large percentage of the town of Bar Harbor had been destroyed by the fire; 67 of 222 summer cottages, and 170 of 667 year round homes were gone. The resulting loss of assessed value was $1,077,000 (17% of assessed value) for year round residences, and $1,128,000 (41% of assessed value) for summer cottages. The Jackson Laboratory, world-renowned even then, was completely destroyed by the fire, 100,000 mice killed except for 1,000 which turned out to be sterile and thus could not provide future generations of genetically pure stock. A generous grant from the Damon Runyon Fund provided the Laboratory with a year’s operating expenses, allowing the work of rebuilding to begin at once. The Great Fire may have changed Bar Harbor forever, but it did not destroy the spirit of the town. Although many of the great summer cottages were destroyed and not rebuilt, the town itself survived. Bar Harbor today is very different from the Bar Harbor of that bygone era. It has become more accessible to the everyday folks—people who come from all over the country and around the world to see this incredible beautiful island paradise on the coast of Maine. While Bar Harbor’s heyday may exist only in memory, those memories are preserved by the Bar Harbor Historical Society. Located at 33 Ledgelawn Avenue, the society has a marvelous collection of old photos and memorabilia from those halcyon days, and is well worth the short walk from the waterfront. Open from mid-June to mid-October, Monday-Saturday from 1-4pm. Admission is free. Call 288-0000 or 288-3807 or visit their website www.barharborhistorical.org for more information.